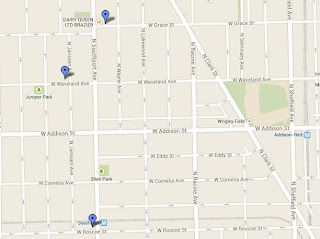 This Google map plots the locations of 3 gunpoint robberies along Southport Avenue since July 28. A Lake View man was robbed at gunpoint around 9:45PM last night in the 1400 block of West Waveland, a few blocks west of Wrigley Field. The man subsequently told his story on Reddit. The gunman is described as a male, white or Hispanic, 5'8" to 5'9" tall, 160-170 pounds, wearing a gray hoodie with white draw strings and dark shorts. He was armed with a small handgun, possibly a semi-automatic model, and was last seen running eastbound on Waveland Avenue. According to authorities, the victim lost his black iPhone in a red case and $25 cash in the robbery. Chicago Police Department case #HW395047. This is at least the third robbery at gunpoint near Southport Avenue in eight days. 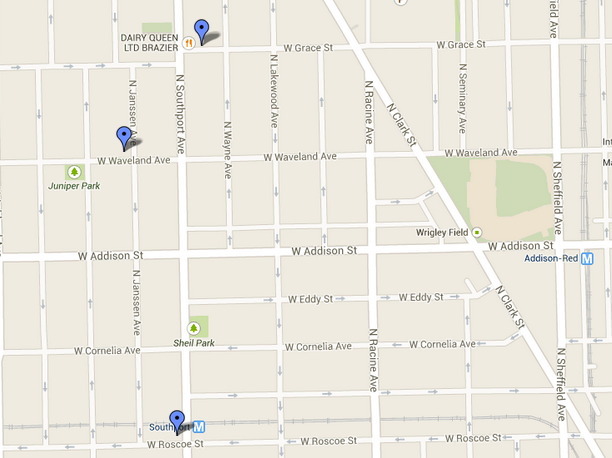 A man was robbed at gunpoint by two gunmen near Grace and Southport at 11PM on July 28. Another man was robbed at gunpoint near Roscoe and Southport at around 11:30PM on July 30. I'm a 250 lb 6'4" male. Having lived in and loved this city, I've come to let my guard down over time. I was jumped by 3 guys over the weekend right outside of Wrigley. I was hit from behind and knocked out, and had my phone stolen. I'm lucky to only have some head pain and dislocated shoulder. I'm a little disappointed no one even bothered to try and intervene or even ask as I was ok as I lay passed out on a corner. But such is life. With this, learn from what happened to me. Protect yourself; know your surroundings. No matter your size or if crowds are around, please be careful and aware. I received an email from Tunney regarding a spat of attacks like this, so be especially careful in the Wrigley area. Thegiggler's story and upwards of 100 responses are worth the read. CWB cannot be certain of the Reddit post's veracity.